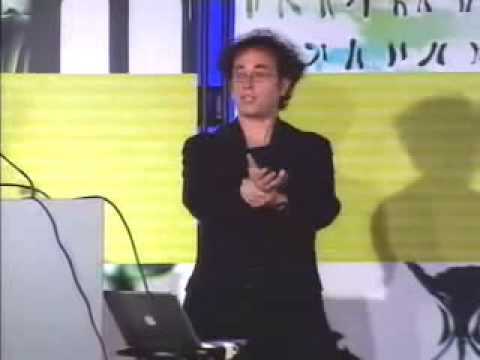 Tod Machover has been widely recognized as one of the most important and innovative composers of his generation. His music breaks traditional artistic and cultural boundaries, offering a synthesis of acoustic and electronic sound, of symphony orchestras and interactive computers, of operatic arias and rock songs, and that delivers serious and powerful messages in an accessible and immediate way. After studying composition at the Juilliard School with Elliott Carter and Roger Sessions, Machover was Director of Musical Research at Pierre Boulez's IRCAM Institute in Paris (1978-85). He is Associate Professor of Music and Media at the MIT Media Lab, where he is also co-director of the new Things That Think consortium. Machover's music has been commissioned and performed by many of the world's most important musicians and ensembles, such as the Los Angeles Philharmonic, the London Sinfonietta, the Ensemble InterContemporain, the Ensemble Modern, and The Saint Paul Chamber Orchestra. His work has received numerous prizes and awards, and in 1995 he was named a "Chevalier de l'Ordre des Arts et des Lettres," one of France's highest cultural honors. Machover's award-winning opera "VALIS" was commissioned by the Centre Pompidou in Paris to celebrate its tenth anniversary in 1987. He composed an unusual mini-opera, "Media/Medium," in 1994 for the magicians Penn and Teller, who toured it throughout the United States. In addition to his work as a composer, Machover is widely noted as a designer of new technology for music. He is the inventor of Hyperinstruments, a technology that uses smart computers to augment musical expression. Some of these hyperinstruments have been designed for such diverse virtuosi as Yo-Yo Ma and Prince, and the "Hyperstring Trilogy" is one of the culminating points of this development. Another direction that hyperinstrument work has taken since 1991 has been towards instruments, tools and environments for non-professional musicians in an attempt to bring creativity and expression to everyday life. The Brain Opera is the culminating point to date of this path. After the Brain Opera, Machover will be working on a new hyperstring work for the Kronos Quartet, and an opera about the CIA for the Houston Grand Opera.